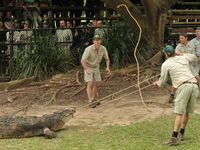 SITTING comfortably like a normal seven-year-old would on a seesaw, Robert Irwin wasn't fazed by the 600kg beast underneath him. 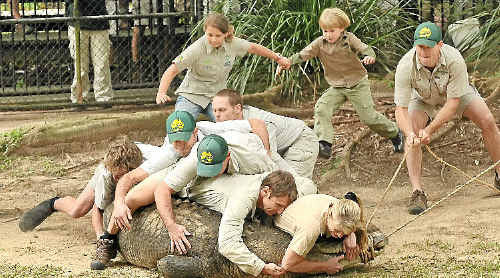 Not a strand of his signature blond bob moved out of place as he helped wrestle the prehistoric reptile. 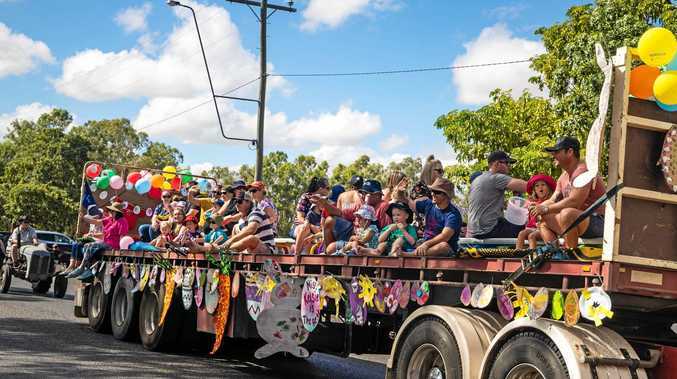 It was the first time Agro the croc had been caught since it was brought to Australia Zoo in 1988. 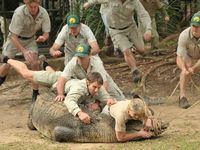 Twenty-three years ago it was Robert's late father, Steve Irwin, who wrangled the reptile by himself in North Queensland, filming the entire thing with a sole camera atop a tripod. But Robert wasn't scared at all. “Ah, no, they're just awesome,” he said. “Well, you've actually got to hold the tail down so it doesn't actually move, because if the tail arches around that means he's getting ready to death roll. With mum Terri at the snout of the beast and sister Bindi holding his hand before they jumped on, Robert was in good company. 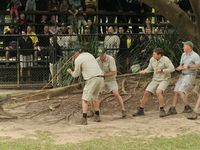 The Irwins, with Steve's best friend Wes Mannion and zoo staff, shifted Agro to a new home in front of a crowd of more than 100 yesterday. 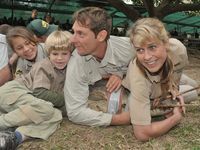 As vets measured, tested and x-rayed the croc, Robert and Bindi joined their mum and Wes at the taped-up mouth for a normal Irwin family photo. Smiling widely to show the gap left by two missing front teeth, Robert looked right at home on the “beautiful” scaly beast. “It is amazing to be laying on top of a modern day dinosaur,” he told the Daily afterwards. Agro, often referred to as Steve's arch nemesis, grunted and rolled violently as he was pinned before 27 men finally carried him out of the enclosure in a metal box.